Tryout dates are set based upon the Atlantic District schedule. A player or full teams may be selected at any time during tryouts. Parents should be available to electronically complete contracts, at all times, at all age levels. Contracts that are not executed, when offered, may not be held at the request of the parent. All tryout fees are non-refundable -- There are no exceptions to this policy. The number and level of teams can be adjusted as necessary, at the discretion of the New Jersey Rockets Hockey Club, based on tryout quantity and quality. Our goal is to have teams that compete at the proper level during the season. No player is guaranteed a position on any of our teams. Our objective is to select the most competitive team possible at every level. No player is guaranteed the right to participate in any specified number of tryout sessions. Cuts or schedule adjustments may be made after the first tryout session, as necessary, to allow the coaches to best evaluate the players. These will be communicated via the New Jersey Rockets website and via email (using the contact information you provide at registration). All player evaluations and selections are made by the Rockets Hockey Club coaching staff, or designees thereof. * Players who are not chosen for Tier I teams can attend the RHC Tier II tryouts at no charge. 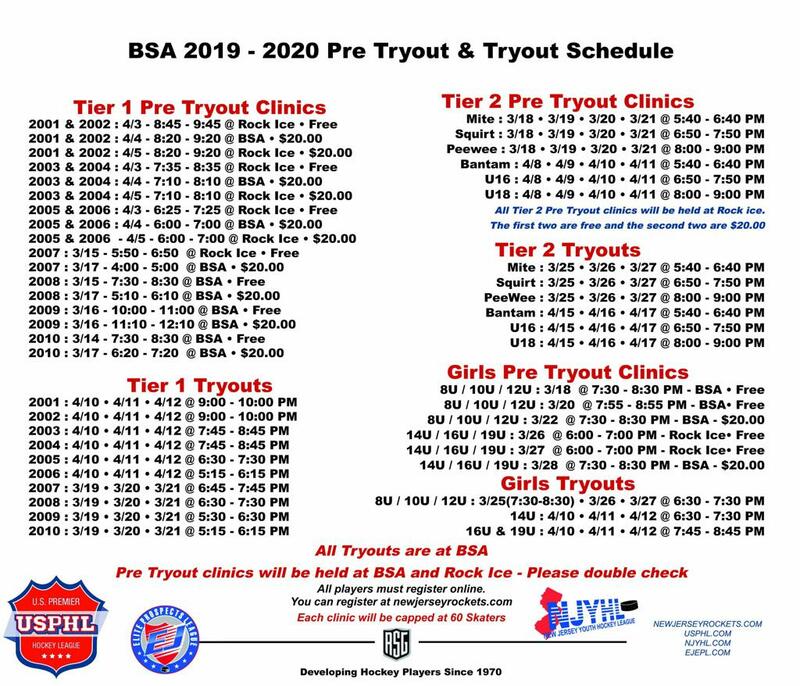 Simply show up for your age-appropriate Tier II tryout.